Ms Oinkee loves: Oinkeebabe is Back! Yeah I am back! It has indeed been more than a month since I blogged. If you followed my Instagram feeds, you would notice I had been travelling back to back. Great to be back home, the familarities and conveniences on this little island which we always take for granted. Though I am still missing the food, the sceneries from my travels. This December is also a time for gatherings and parties, lots of food and booze. Watch out for my upcoming blogs on the festive offerings from my dear sponsors and how I get myself ready for the upcoming parties. Wohoo it is getting exciting! Enjoy the festivities, spread the love to all your dearies and stride through the remaining 2014 with lots of memorable moments. 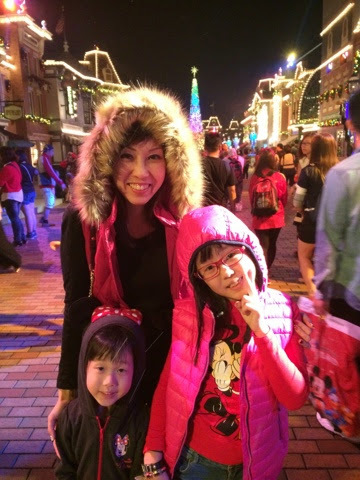 Loving this shot with my AnneLene at Hong Kong Disneyland on our recent family holiday.